Inter-City News ~ Serving Fairmount, Mount Washington, Maywood, Englewood, Sugar Creek, Missouri: What the He!! is This? If you have not been North of Kentucky on Vermont St. for a couple of months, you are in for a surprise. Two huge tanks are being constructed at the location of the old asphalt area in the former BP refinery. 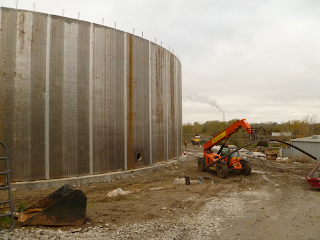 These two tanks are just one part of a large sewer improvement project that is just getting started. Like many other cities, including Sugar Creek, Independence chose to route storm water into the sanitary sewers. This was the cheapest way to dispose of the problem. The Federal Clean Water Act was passed in the 1970’s to control the discharge of pollution in our waterways. The Independence sewage treatment plan on Rock Creek handles most to the sewage and storm water in Western Independence. When heavy rain events occur this facility can not handle the combination of sewage and storm water. This results in overflows that release raw sewage into the Missouri River and is a violation of the discharge permits. Several years ago the EPA required Independence to develop a plan to correct this problem. The two tanks on Vermont along with two more on Wilson Rd. are intended to store excess flows until the treatment plant can handle the untreated water. There is also going to be a new sewer line that will be installed along Elizabeth St. from Forest to Sterling in the future. During periods of high flow several of the manholes along Elizabeth blow their covers and release raw sewage along Elizabeth St. The new sewage main should correct this problem.